You Are: Home | NEWS | SURFACED AMERICAN LUMBER – IS IT SUCH A BAD THING? SURFACED AMERICAN LUMBER – IS IT SUCH A BAD THING? Grading is often done after surfacing – when this occurs the grader can see the nature of the board very clearly and is much less likely to include boards in the higher grades that shouldn’t be there. The presentation of the bundles is improved, and coupled with proper end trimming produces an enhanced quality product. Many U.S. Shippers do not always charge for the process as the increased production and loading efficiencies cover the additional cost. So why are U.K. importers so reluctant to buy surfaced lumber? There seems to be two main reasons. Firstly there is a fear that any lumber that has lost any of its “meat” will lead to some clients being unable to finish the board at their desired thickness. This can be a legitimate problem, especially where complex machining processes are producing a number of small components out of each board. However there are some end users who for example have always been able to get 21mm or even 22mm finished thicknesses out of 4/4 lumber due to the U.S. industry’s tendency to cut generously, but with improving technology and more precise sawmill equipment being installed, American producers will be less inclined to give away free wood! An adjustment on the finished product to use 19mm or 20mm finished component sizes would be reasonable. 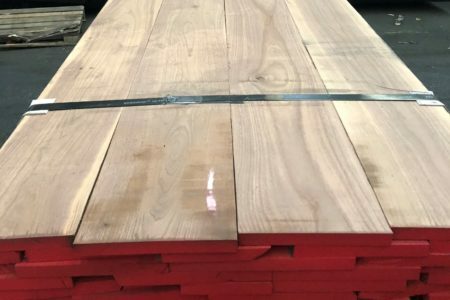 The other reason is that there is a small number of end users who panic when they see surfaced lumber thinking that it might be the rejected boards from another client of the importer’s. This is a bit hard to believe as the customers own eyes can tell if the lumber is good or not. I do wonder if this is used more as an excuse than a genuine concern. NHG does not as a rule bring in stock, but the advantages of surfaced lumber, especially in a species such as walnut, persuaded us to trial this and introduce a new mill to the U.K. market. Trial bundles are still available for those who wish to benefit from the undoubted advantages of buying surfaced stock!